After the Knox County dragon boat team graciously allowed me to paddle with them in the Second Annual Tennessee Clean Water Network (TCWN) Dragon Boat Race Festival, I thought it would be more spectacle than competition. Spectacle there was: bankers dressed as pirates, a team in superhero costumes, Knoxville Zoo staff showing off snakes and a Komodo dragon skull. A guy in an American flag speedo, suspenders and a frizzy bright green wig strutting around in the 90-plus degree heat. Sweet P’s Barbecue served food and beer, the River (106.1) broadcast music, and the 46-foot long boats were decorated with a dragon head and a dragon tail. Underlying the celebratory facade, people were dead serious about propelling these boats as fast as possible up the Tennessee River. At opening ceremony, Penny Behling, owner of Dynamic Dragon Boat Racing LLC, Renee Hoyos, executive director of TCWN, and Mayor Madeline Rogero. 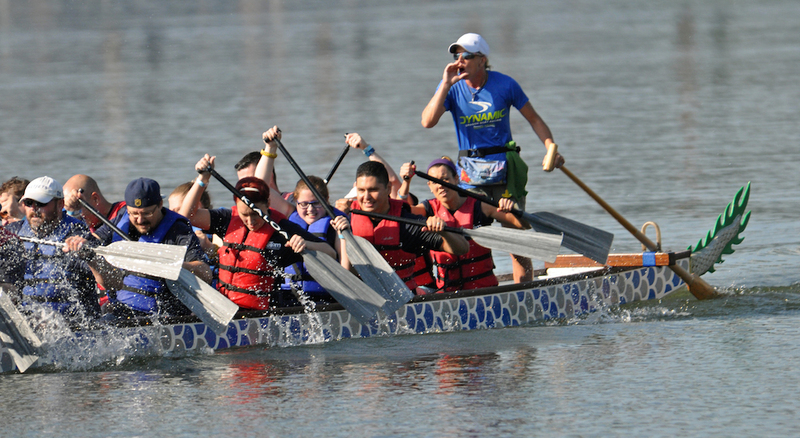 Nineteen teams gathered at Volunteer Landing on Aug. 27 and raced in heats against two or three other boats, twenty paddlers to a boat, with a “drummer” on a high seat in the bow, and a steerer in the stern, provided, for the most part, by Dynamic Dragon Boat Racing LLC. Denso, a major sponsor, had six teams there, and Knoxville itself was represented by Dragon City Hall, with Mayor Rogero cheering them on. A couple of club teams, the Charlotte Dragon Boat Association (Charlotte Fury) and the Chattanooga Dragon Boat Club, burned down the river fast enough to leave wakes. 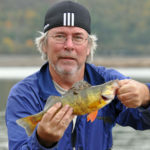 At practice on Thursday, only about 14 of our team, the Knox County Fish Tales, showed up. Our guest drummer, Penny Behling, the owner of Dynamic Dragon Boat Racing, complimented us on how synchronized we were and how well we followed instructions on different paddle strokes, which I understood as fast and faster. Behling, with her headset microphone, commanding presence, and enthusiasm got the Fish Tales fired up for race day after a practice session that amounted to much more of a workout than I’d expected. Penny Behling, owner of Dynamic Dragon Boat Racing LLC, steering a dragon boat. I’ve paddled a good bit, but never in a dragon boat bunched in with 19 teammates and never in a sprint like this. The fiberglass boats weigh 650 pounds, so it takes some hard paddling to get them going. Teams propel their boats down a 250-meter course, which takes about a minute and a half and 70 strokes. By the end, with everybody pulling hard, it seems like you’ve gathered a good bit of speed. Though it’s billed as the eighth fastest growing sport in the world, dragon boat racing has been around for around 2,300 years. It started on the Mei Lo River as homage to Chinese poet and patriot Qu Yuan, who was banished from the kingdom by a corrupt king. After learning of his kingdom’s defeat and devastation by a warring state, the poet committed ritual suicide by immersing himself in the river. In response, people launched boats into the river beating drums and splashing with their paddles to ward off evil spirits from the beloved poet. Angela Howard, in charge of business development at TCWN, told us on practice day that the organization had recently helped put a stop to some industry pollution of the river just a few miles upstream of the festival. On race day, before our first heat, my racing partner, David Sandidge (Public Building Authority), kept saying, “Something doesn’t feel right.” The boat, almost full, did feel tippier than on our practice run, but I tried to reassure him. No use thinking about turning over in front of so many people, in this urban water. Short one paddler, we stayed upright and came in a respectable three (out of three), with a time of 1:33. One of our team leaders, Khrysta Baig (wellness and communications manager for Knox County), gave us a pep talk on digging our paddle blades further into the water and using our whole body to power down the river. Our synchronicity was great; we just needed more power. In the second heat, there were four teams, and to our right was the Charlotte club team (the Fury), dressed in black sleeveless uniforms to show off their muscles. Sandidge and a few others in our boat did some genial trash talk, and their crew hardly smiled. Their wake was rocking us 20 seconds into the race and they finished at 1:12 to our 1:31. Even though we were fourth out of four teams in this heat, we improved our time by two seconds, reason for celebration. What our team did not achieve in speed, we more than made up for with creativity. Only our team had an original poem, written by Sarah Bounse, a health educator at the Knox County Health Department. Baig made fish necklaces for the team from old file folders. 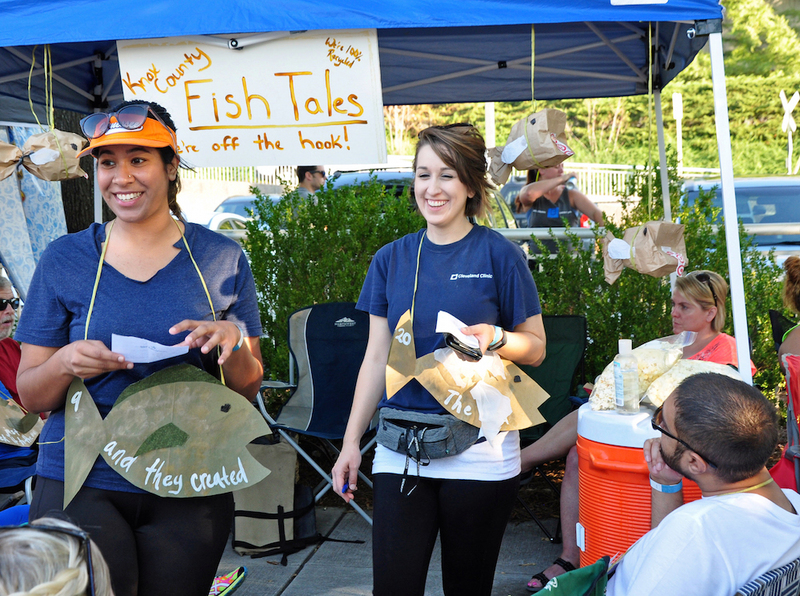 We walked around the festival wearing fish that featured phrases from the poem so that people would remember the purpose of the race—clean water. Charlotte went on to win the gold medal of the club competition with a final time of 1:14.067. Among the rest of the competition, CNS Y12 (2 Fit to Float) won the gold medal with a time of 1:15.569, edging out silver medal winners Blazin’ Paddles, at 1:15.636. 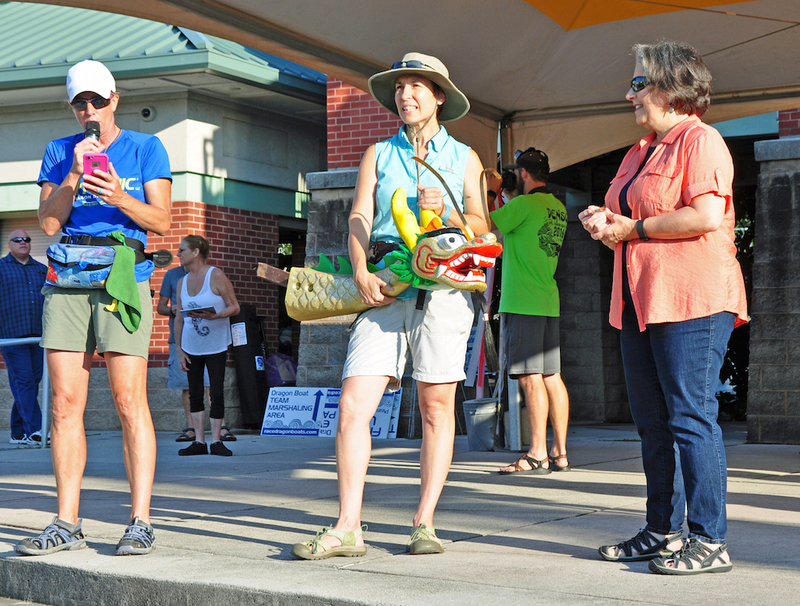 The dragon boat race raised roughly $32,000. 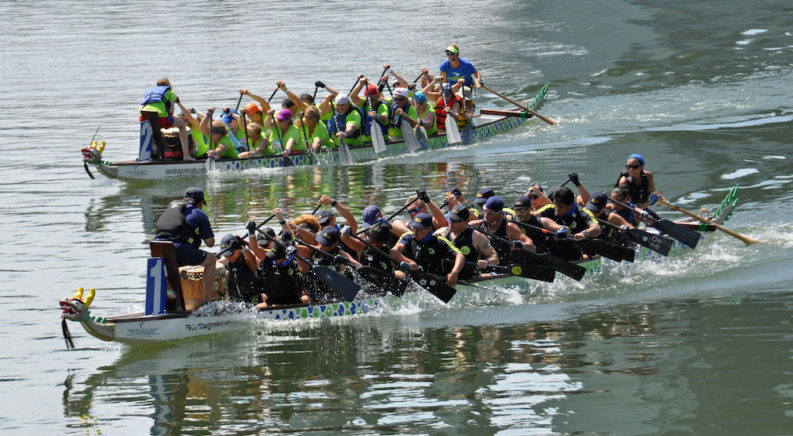 Charlotte Fury and Chattanooga Dragon Boat Club fight it out.